There are a lot of good orzo salad recipes out there in the blogosphere. And I have made many of them. Here is one just in time for your 4th of July BBQ. I had this bookmarked since I saw Giada make it on her show months back. My mother in law recently had this at someone's home and said how much she enjoyed it, so I decided to make it and bring it to a backyard BBQ. It was easy, and I had everything in my garden (except for the chickpeas). I think cooking it in the chicken broth made it better than cooking the orzo in water. It was light and delicious and was great accompanying grilled foods. Pour the broth into a heavy large saucepan. Cover the pan and bring the broth to a boil over high heat. Stir in the orzo. Cover partially and cook until the orzo is tender but still firm to the bite, stirring frequently, about 7 minutes. Drain the orzo through a strainer. Transfer the orzo to a large wide bowl and toss until the orzo cools slightly. Set aside to cool completely. You can make this one day ahead and bring it to room temperature before serving. 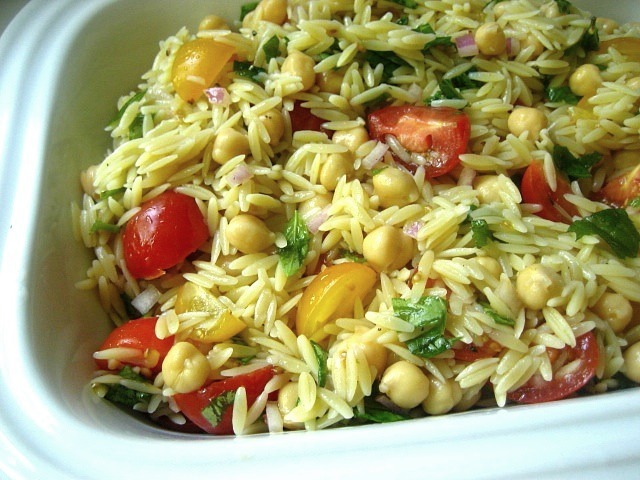 I'm a big fan of orzo lately. It's so light and pretty and so much faster and easier to cook than rice. Love all of the herbs in this. I'll have to cook my orzo in chicken broth next time. Great idea. Why didn't I think of that? Hope you have a happy fourth of July weekend. We've both got chick peas on the brain today. 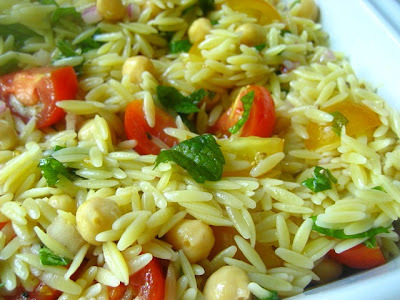 This orzo salad looks like a great meal for summer days (and nights). This looks wonderful. Just what I was looking for to round out my picnic menu. I love that it can be served room temp and the chickpeas make it a complete meal, great for taking leftovers to work. I happen to have the ingredients for this. Sounds wonderful and like something I would really enjoy. p.s. I made a meatless fresh roasted tomato pasta sauce last night. The only other ingredients were caramalized onions, roasted garlic, fresh basil and parsley from the herb garden and a little tomato juice. Someone who shall remain nameless but is AKA the meat-a-tarian had 2 plate fulls! Sounds amazing! I'm sure the chicken broth added significantly more flavor to the orzo. I really love salads like this! I like the combination of basil and mint. Nice! Wow this is definitely my kind of meal! I love how colorful it is! Hi Stace - now that does sound good! Ooh - this sounds perfect for this weekend. I was trying to find a pasta salad that was relatively healthy and this is it. Giada is always a good source and I love that she cooks the orzo in chicken broth. I have lots of basil and mint in the garden. Thanks for sharing. Made a double batch yesterday for a BBQ. I subbed red and yellow peppers for the tomatoes (my peeps won't touch them) and added a can of drained and rinsed black beans. Also, replaced chicken broth with vegable broth. The meat-lovers and vegetarians alike went for this like crazy! Definitely on my repeat list.